The Russian Defense Ministry says that the Syrian Air Defense Forces shot down 71 of 103 missiles launched by the US, the UK and France last night. According to the Russian Defense Minisry, the US and its allies fired cruise missiles, including seaborne Tomahawks and GBU-38 guided bombs from B-1B planes while F-15 and F-16 fighter jets launched air-to-surface missiles. The UK Air Force’s Tornado aircraft fired eight Scalp EG air-launched cruise missiles. Four missiles were launched at the area of the Damascus International Airport. All these missiles were intercepted. 12 missiles were launched at the Al-Dumayr Military Airport. All these missiles were intercepted. 18 missiles were launched at the Baly Military Airport. All these missiles were intercepted. 12 missiles were launched at the Shayarat Military Airport. All these missiles were intercepted. 9 missiles were launched at the Mezzeh Military Airport. Five of them were intercepted. 16 missiles were launched at the Homs Military Airport. 13 of them were intercepted. 30 missiles were launched at targets in the areas of Barzah and Jaramani. Seven missiles were intercepted. 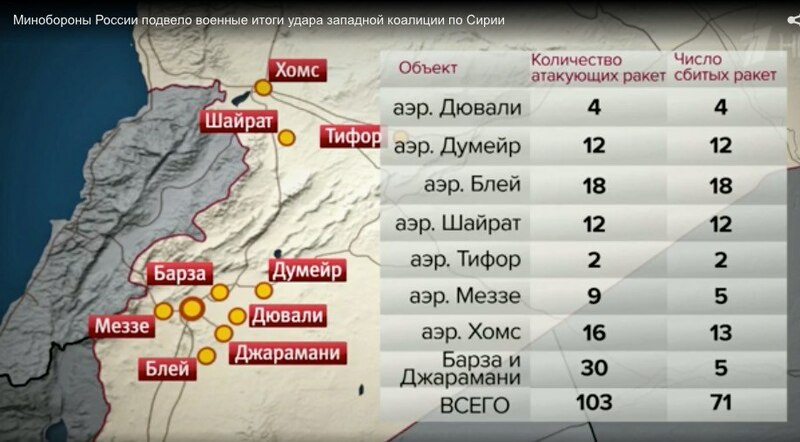 According to the Russian Defense Ministry, the facilities in the areas of Barzah and Jaramani were partly destroyed. The military added that these facilities had been for a long time abandoned and had not been invovled in the production of chemical weapons in contrary to the claims of the US-led coalition. Meanwhile, US President Donald Trump continued his “smart missiles” story and described the last night strike as “perfectly executed”. As many as 112 surface-to-air missiles, including 25 Pansir S1 missiles, were used by Syria’s air defense forces to repel the strike delivered by the United States, France and the United Kingdom, Russian Defense Ministry spokesman said. 25 missile were fired from the Pansir-S1, with 23 of them hitting targets. 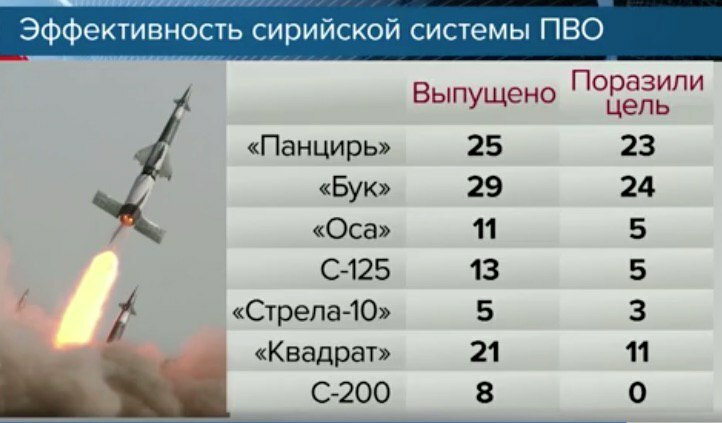 Twenty-nine missile were fired from the Buk system, with 24 of them hitting targets. Eleven missiles were fire from the Osa system. Five of them hit the targets. Thirteen missiles were fired from the S-125 system, five hit the targets. Twenty-one missiles were fired from the Kvadrat system, eleven hit the targets. Eight missiles were fired from the S-200 systems, none hit the targets,” he said, adding that such poor performance of the S-200 system could be explained by the fact that it was meant to hit aircraft. Moreover, in his words, a missile fire from this system hit a fighter jet of one of the neighboring countries not long ago.